By Henry the Eighth’s time it had become an established Christmas dish, and we find it ushered in at this season to his daughter the Princess Mary, with all the usual ceremonies, and no doubt to the table of the monarch himself, who was not likely to dispense with so royal a dish; and so to the time of Queen Elizabeth, and the revels in the Inns of Court in her time, when at the Inner Temple a fair and large boar’s head was served on a silver platter, with mistrelsy. 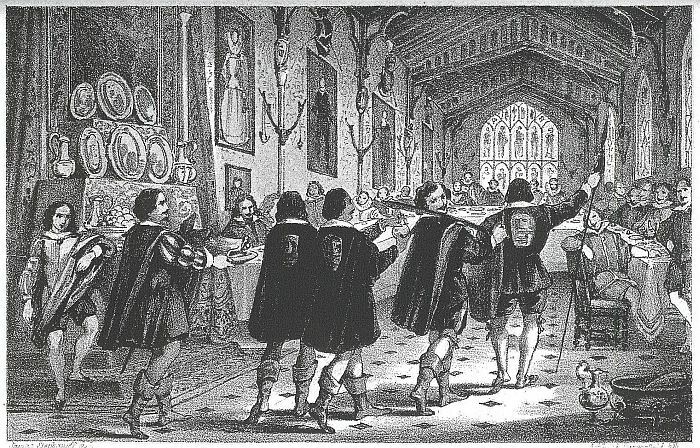 At the time of the celebrated Christmas dinner, at Oxford, in 1607, the first mess was a boar’s head, carried by the tallest of the guard, having a green scarf and an empty scabbard, preceded by two huntsmen, one carrying a boar spear and the other a drawn faucion, and two pages carrying mustard, which seems to have been as indispensable as the head itself. A carol was sung on the occasion, in the burden of which all joined. Brawn is probably as old as boar’s head; but the inventor of such an arrangement of hogsflesh must have been a genius, and would have been a patentee in our days, and probably have formed a joint-stock brawn association. We have just observed it in the time of Henry the Third, and the ‘begging frere,’ in ‘Chaucer’s Sompnoure’s Tales,’ says, “geve us of your braun, if ye have any,” and it may be found in most of the coronation and grand feasts; even in the coronation feast of Katharine, queen to Henry the Fifth, in 1421, brawn and mustard appear, though the feast was intended to be strictly a fish dinner, and with this exception and a little confectionary, really was so, comprising, with other marine delicacies, “fresh sturgion with welks,” and “porperous rosted,” the whole bill of fare, however, would match even the ministerial whitebait dinner. This is not the only instance where brawn was ranked with fish; for when Calais was taken, there was a large quantity there; so the French, guessing it to be some dainty, tried every means of cooking it; they roasted it, boiled it, baked it, but all in vain, till some imaginative mind suggested a trial au naturel, when its merits were discovered. But now came the question, in what class of the animal creation should it be placed? The monks tasted and admired: “Ha! ha!” said they, "capital fish!" and immediately placed it on their list of fast-day provisions. The Jews were somewhat puzzled, but a committee of taste, of the most experienced elders, decided that it certainly was not any preparation from impure swine, and included it in their list of clean animals. At the palace, and at the revels of the Inns of Court, it seems to have been a constant dish at a Christmas breakfast. Tusser prescribes it amongst his good things for Christmas, and it has so remained to the present time.